Episode 38: "Rhyme or Treason"
In London's Pentonville Prison, a priest accompanies James Coslow who has been condemned to death for treason. The prison governor is announced and informs Coslow that the king has commuted his sentence to life due to past service to his country, to which Coslow protests his innocence. A television game show is in progress, and Linda Coslow has just won a sizable monetary prize. When asked by the game show host her plans for the money, Linda evades the question stating that, although her plans are private, stating that "when it’s done, I shall want everyone to know about it." Later, Linda meets with Charlie Chan. She tells him that she has raised money for an investigation through her participation on quiz shows, asking the detective to take the case to acquit her father of his treason charges. 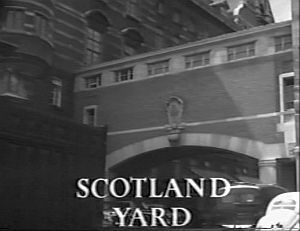 Chan, recalling Linda's father as a renowned poet prior to his conviction, agrees to help, noting that he will seek information from his good friend, Inspector Duff of Scotland Yard. 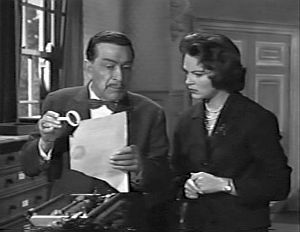 At Duff's Scotland Yard office, Chan is informed by his friend that the evidence against Coslow is very conclusive. As Coslow was convicted mainly on the testimony of fellow members of his security unit, Chan suggests that one or more may have perjured themselves. Duff shows Chan a small book of poetry by James Coslow. Inside the book is a paper containing a numeric code corresponding to pages, lines, and words of the poetry inside the book that was proved to have been typed on Coslow's typewriter. Duff informs Chan that this was the method used by Coslow to send secrets out of the country. 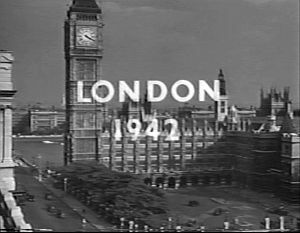 Chan then begins his investigation with a visit to the home of Sir Aubrey Tauard, who was the commanding officer of Coslow's security unit and who is now seeking an important government post. Sir Aubrey tells Chan how his security unit was involved in top secret research during the war at Benham House, a large country manor house that was taken over by the government for the project, and how information was obviously being leaked to the Germans. When it was found that his close friend James Coslow was the person responsible, he was shocked. Sir Aubrey quickly agrees to assist Chan in his investigation, offering the detective a list of all who served on his security unit during the war, including one Maxwell Dugan who currently works with Sir Aubrey. Chan requests a meeting with everyone on the list to be held at Benham House, which has remained abandoned but left in the same condition since the ending of the war. At Benham House, Charlie Chan meets with all of the persons listed by Sir Aubrey plus Coslow's daughter, Linda. He begins with Winifred Murdock, who was James Coslow’s secretary. Following Chan's questioning, she admits that she was in love with Coslow but that he didn't respond to her advances. Questioning an impatient Maxwell Dugan, Chan learns it was he who had accused Coslow of espionage, having found the book of poetry containing the typed code numbers in Coslow's desk. Chan then speaks with Cecil Barrows who admits he is "dying for a drink," which has evidently been a passion of his for years. Attempting to adjust a large picture hanging crookedly on the wall, Barrows causes the painting to fall, nearly injuring Chan, although he insists it was an accident. Upon questioning, Barrows states that he thought highly of Coslow's work while Chan notes that it was he, Barrows, who took Coslow’s position when the latter was convicted. Moving on to Sir Aubrey, Chan notes that he is about to be promoted to the office of undersecretary. Questioned, Sir Aubrey tells the detective that although he wasn't present when Dugan found the codes in Coslow's desk, he was present when the book and codes were removed from the drawer. Chan dismisses everyone, remarking to Sir Aubrey that, contrary to Mr. Dugan’s opinion, the meeting and interviews were not a waste of time. Before leaving, Chan shows Sir Aubrey how the secret drawer in which Coslow’s book and typed code were found is a common, known feature of such a desk, causing the detective to ponder why Coslow would have hidden such incriminating evidence in such an obvious location. After Sir Aubrey departs, Chan finds the typewriter that was used by Coslow and asks Linda Coslow, an expert typist, to type out a sample message. He notes that an expert typist's work will, due to even key pressure, exhibit a uniformity which was evident with the typed code, while an inexperienced typist's work will reveal an uneven quality. Linda states that her father's secretary, Winifred Murdock was an experienced typist and that she had a motive, unrequited love, for framing her father. Asked if she could recall if her father had been a practiced typist, Linda, pausing, could not remember. The detective tells her that he will need to pursue that matter on his own before proceeding. 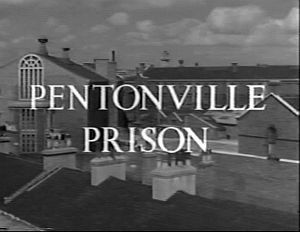 Through the help of Sir Aubrey, Charlie Chan is able to meet with James Coslow inside Pentonville Prison. When asked if he used on finger or all fingers when typing, Coslow states that, as an untrained typist, he used only one finger, possibly two, when typing, news that pleases the detective. Visiting Sir Aubrey, Chan states that he has spent the morning looking through old Nazi files at the War Ministry containing the names of those who were to become secret leaders of all countries that were to be occupied by Germany. Interestingly, Chan could not find the document containing the name of the person who was to be the secret leader in Britain. Working with Linda Coslow, who is fluent in German and using a German typewriter, Charlie Chan produces a fake Nazi document. That evening, with the help of Linda Coslow, Chan assembles all suspects. In front of everyone, he reveals the old Nazi documents relating to the secret leaders for occupied nations. Chan contends that these documents are copies obtained from military headquarters in occupied Germany, and that they contain the missing information regarding the name of the person who was supposed to be the secret leader in occupied Britain. Suddenly, the lamp lighting the room is smashed and the papers are ripped from the detective's hands and tossed into the fire of the fireplace. When light is restored, Maxwell Dugan and Sir Aubrey are seen struggling on the floor. Separated, each accuses the other of being the traitor. Admitting that the burned document were fakes, Chan reveals that as Sir Aubrey has been a foreign correspondent, he was a skilled typist, while it was known that Dugan was not. Sir Aubrey struggles to escape, but Chan, holds him at gunpoint. Later, Charlie Chan reunites Linda Coslow with her father, refusing her offer of payment for freeing her father. Big Ben – The nickname for the Great Bell of the clock that is housed in the tower, completed in 1859, located at the north end of the Palace of Westminster in London. Pentonville Prison – Opened in 1840 in London, England, Pentonville prison became the model for British prisons. Between 1902 and 1961, 120 men were hanged at Pentonville, and this prison remains a major London prison to this day. 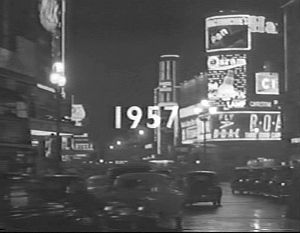 Piccadilly Circus – Close to major shopping and entertainment areas in London's West End, Piccadily Circus is a major traffic junction and a popular meeting place and tourist attraction. Scotland Yard – The storied headquarters of the Metropolitan Police Service, which is responsible for the policing of most of London. Have always believed in philosophy, nothing accomplished if nothing endeavored.